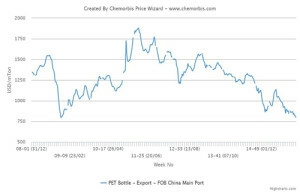 In China, export PET prices hit another low during this past week as reported on www.ChemOrbis.com. Export offers lost $20/ton at both ends of the range and reached below the $800/bbl threshold. Current export prices indicate the lowest levels reported since mid-November of 2008. In upstream news, three producers already nominated their new January MEG contracts with $40-80/ton decreases from December, according to ChemOrbis. Meanwhile, spot upstream PET production costs are also down both on a weekly and monthly basis for PX and PTA but MEG remained mostly steady. 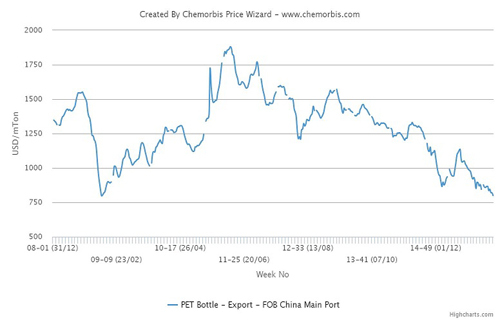 PX and PTA prices are down $30/ton when compared to the beginning of the month while they are $15/ton and $10/ton down on a weekly basis, respectively. On another note, crude oil prices on NYMEX hit below the $35/bbl threshold last Thursday. As the year end is just around the corner, it appears that PET players are even more hesitant to make fresh purchases while no supply issues are voiced.